I was over on Bree's blog Twinkle in the Eye a little while ago, having a read and she has done a feature on Lisa from Sweet Little Pretties. Lisa has a meme that she's started called Sweet Little Things About Me and I thought I'd give it a go and join in. This week Lisa is asking if we prefer Vegemite or Peanut Butter. To be honest, I love both, but if I could only have one every day for the rest of my life I would probably choose Vegemite. I just love the stuff, it's soooo good. When I was pregnant I had at least one slice of toast with Vegemite every single day. 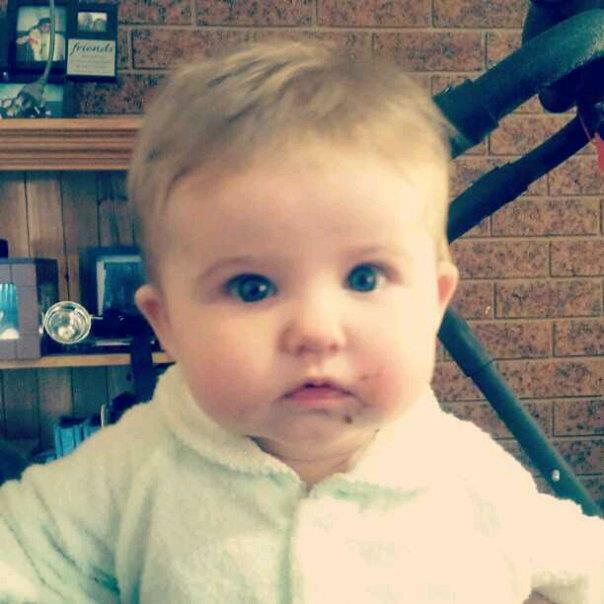 It's no surprise that Mia is also a happy little Vegemite and loves her some Vegemite toast too. And we don't use a little bit either, we both like it thick! Having said that though, there are some times when I just really crave a slice of toast with a thick slathering of Peanut Butter. It really is good stuff. I don't mind chunky peanut butter but my preference is for smooth. Thick and smooth on a piping hot piece of toast. That's how I love my PB. So what about you, Vegemite or Peanut Butter? Oooo, yes, honey on crumpets, I haven't had crumpets in soooo long, now I have a craving, thanks! Yep, I think I definitely prefer smooth too. I haven't had honey in so long, I think it's time to change that! I do love me some Vegemite but I have to vote for smooth peanut butter on multi grain toast! I LOVE smooth peanut butter on multigrain toast, and the thicker the better! I like PB and Vegemite and at times in my life have swayed wildly between the two. My current favourite is peanut butter. Ever since I went sugar free late in my pregnancy peanut butter has felt like a sweet treat, even though I only ever buy 100% peanut varieties. Btw my brother used to LOVE the two combined! The two combined??? Now that is something I have never tried but now I am thinking I might need to give it a go! I'm always up for trying combo's of my fave foods. The worst though was tuna on weet-bix...never, ever do that! No worries Lisa, thanks for giving me something different to blog about! What a sweet little girl! Definitely Vegemite and (although going against what everyone else has said) I do prefer chunky peanut butter on the rare occasion I have it. I love both too :) The strange thing is that with my last pregnancy I wanted peanut butter sandwiches the whole time, with this one I constantly want Vegemite on toast!